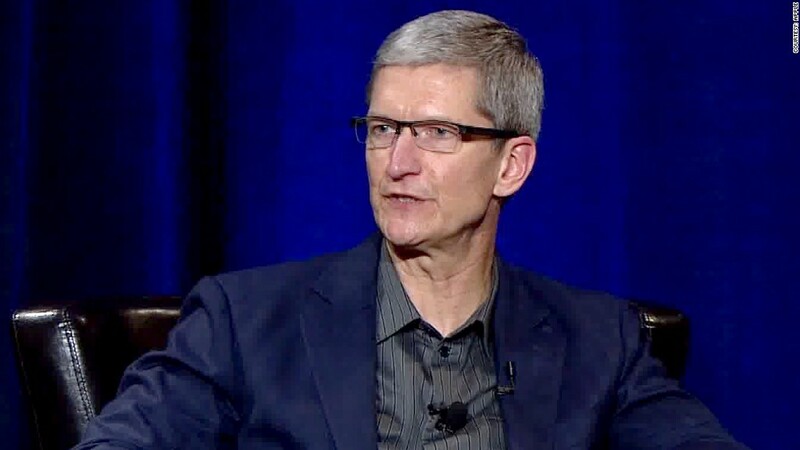 Apple CEO Tim Cook faced questions about the Einhorn lawsuit, Apple's declining margins, and whether the iPhone has reached saturation. Apple CEO Tim Cook slammed activist shareholder David Einhorn on Tuesday, calling his lawsuit a "silly sideshow." Einhorn made headlines last week by suing Apple and lambasting the company for hoarding billions in cash. Einhorn's hedge fund, Greenlight Capital, wants Apple to give some of its $137 billion cash hoard back to shareholders in the form of preferred stock. "Frankly, I find it bizarre that we would find ourselves being sued for doing something that's good for shareholders," Cook said, calling the lawsuit a waste of time and money. Cook also cited one of Einhorn's lines in the complaint: "Apple doesn't have a 'Depression-era mentality,'" Cook said. "Apple makes bold and ambitious bets on products, and we're conservative financially." Though Cook said Apple isn't spending a lot of time thinking about the suit, the company is reviewing Einhorn's proposal. Apple will the let shareholders vote at the company's annual meeting this month whether to block the possibility of ever issuing preferred shares. Greenlight promptly filed a lawsuit in federal court. Related story: Einhorn to Apple: Give us more cash! Still, Cook admitted "we do have some cash" -- a reference to the company's $137 billion in cash, drawing laughs from the audience. He also said Einhorn's suggestion is "creative," and he repeated sentiments from an Apple press release about "seriously considering" proposals from Greenlight and other shareholders. Apple is expected to issue a formal response on Wednesday, and Einhorn in turn is expected to release his own statement on Friday. Shares of Apple (AAPL) sank 2% on Tuesday. Cook also addressed other concerns investors and analysts have about Apple, including the company's declining margins. The CEO used an oft-repeated line about Apple's "special sauce" of hardware, software and services, which he said takes pressure off product margins. "Because we're not a hardware company, we have other ways to make money and reward shareholders," Cook said. "Being larger than a hardware company" lets Apple not worry so much about short term issues like quarterly margins, he added. Cook similarly pushed back on Blankfein's suggestion that the iPhone has hit its peak. The smartphone market is expected to double over the next four years, Cook noted, and he thinks virtually all feature phone owners will switch to smartphones during that span as well. As he has many times before, Cook also shut down suggestions that Apple should build cheaper phones to increase iPhone penetration in emerging markets. "For years, people said why don't you have a Mac that's less than $500?" Cook said. "Frankly, we worked on this, but we couldn't build a good product [at that price point]." Instead, he said, Apple built the $499 iPad. He also pointed out that tech products always come down in price as they become obsolete: "When we came out with iPod, it was $399 ... today you can buy iPod Shuffle for $49." It will be a long day for Cook, who's flying across the country to sit with First Lady Michelle Obama at the State of the Union address Tuesday night.